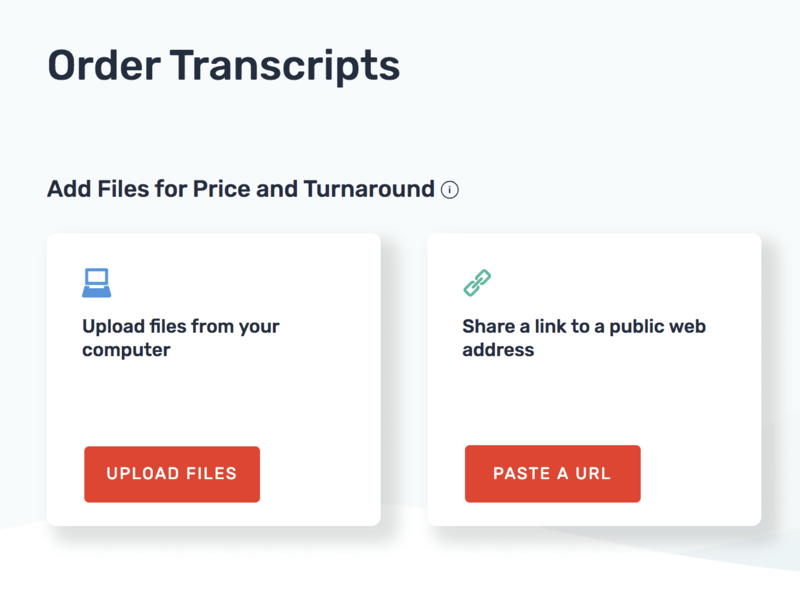 Last month, we rolled out one of our most highly requested transcription features to date – a Rush transcription service to help our customers meet tight deadlines with ease. To date, advertising and marketing firms, production agencies, news companies, and law firms have used Rush to turnaround projects, digital media stories, and client meetings quickly. By delivering transcripts back to customers up to 10x faster than our standard delivery, Rev’s Rush delivery offering helps individuals and teams work smarter (not harder) so they can move onto their next tasks ASAP. Starting at standard transcription prices per audio minute, these range from $0.95/min on the low end (Transcription Panda) to $3.00/min on the high end (3Play). However, for this wide range of price points, transcription companies all report that their transcripts meet 99% accurate quality guarantees. When simply considering standard price and quality, Transcription Panda, Rev, and GoTranscript are your best budget transcription providers. Moving onto the cost of Rush, expediting your order can cost anywhere between an additional $1.00/min (Rev) to an additional $2.50/min (3Play). 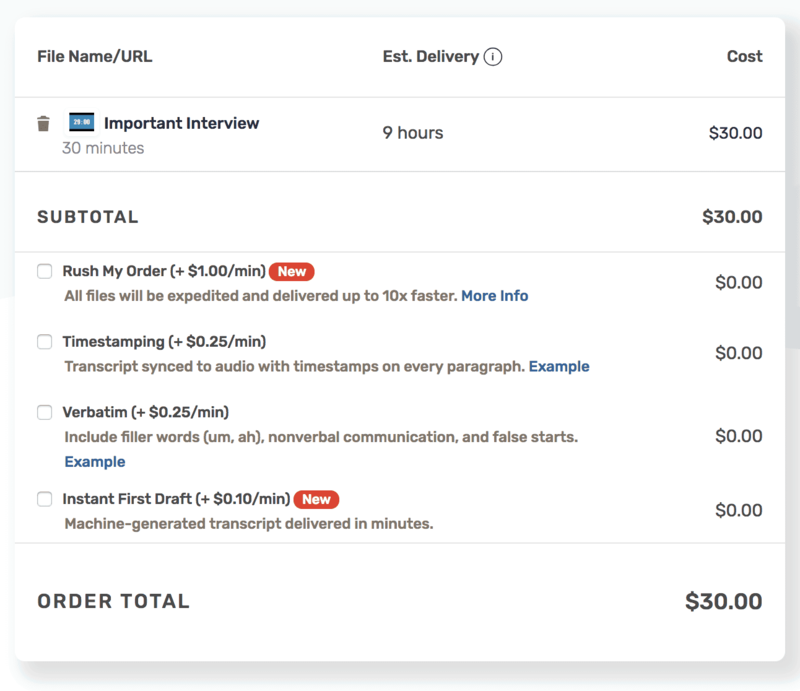 If you simply add up the cost of a transcript with the addition of Rush, Rev leads the pack at $2.00/min followed by Transcription Panda at $2.20/min and TranscribeMe at $2.50/min. However, it’s also important to consider what potential restrictions transcription companies place on Rush orders. Common restrictions include file size, audio quality, and times of day/week that uploads must occur. For example, TranscribeMe limits Rush orders to high-quality audio files only that are shorter than 70 minutes in length. Verbal Ink, GMR Transcription, and 3Play, on the other hand, all limit when Rush orders can be placed; this means that if you’re working on an urgent project later in the day and need a transcript back ASAP, you can’t use these Rush services to meet your deadline. Rev, Transcription Panda, and GoTranscript are rare in that they apply zero restrictions for the types of Rush files placed or the time of day files are uploaded. On top of paying more for a Rush service, some transcription companies also charge you more for having more than two speakers in your audio file. Having multiple speakers can cost you either $0.00/min or up to an extra $0.25/min. Rev, TranscribeMe, Transcription Panda, and 3Play are all transcription companies that include multiple speakers in their standard pricing package. 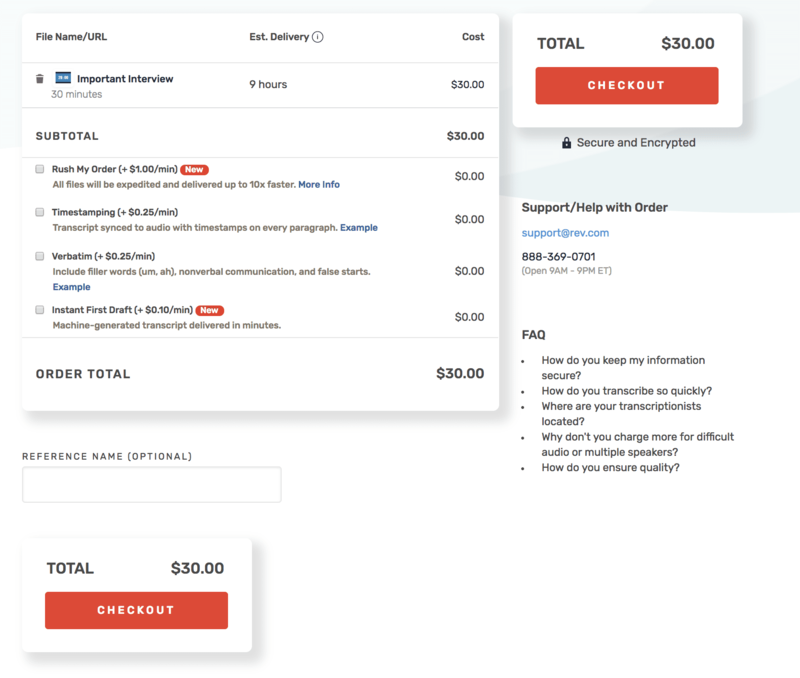 GoTranscript, Verbal Ink, and GMR Transcription all charge an additional $0.25/min for audio files with multiple speakers. When you thought you were done paying add-on fees, some transcription companies even tack on more for having speakers with non-American or non-English accents in your audio file. Here, fees range from $0.00/min to $0.75/min. Rev, TranscribeMe, and 3Play are the only transcription companies that do not charge you extra for having accented speakers. GMR Transcription charges customers the most, with an add-on fee of $0.75/min for these speakers. The final point to consider before choosing a Rush transcription service provider is how fast you can get your files back. Delivery times for 30-minute files run the gamut from 2 hours on the low end (Rev) to 24 hours on the high end (Transcription Panda). If you’re working on a particularly tight deadline where you need to get your transcript back within a few hours, Rev is your best bet. For files under 60-minutes, Rev will get your file back to you in 3 hours or less (on average). But if you have a more flexible timeline and can wait up to 12 hours, TranscribeMe, Verbal Ink, and GMR Transcription are good contenders. For those with 24 hours to spare, Transcription Panda’s Rush service may be a good fit. Overall, when trying to determine which Rush service to use, it’s important to consider the standard price per minute, quality, the cost of Rush, the cost of add-on fees, and estimated delivery times. With all of these in mind, the clear front-runner with the lowest overall price and fastest estimated delivery time is Rev. For a 30-min file, Rev’s Rush service will cost you $60 total ($2.00/min) and you’ll get your file back in approximately 2 hours. Ready to crush your deadlines and Rush your transcription orders? Need some more information on how to place a Rush order with Rev? Here’s a quick step-by-step guide. 1. Go to Rev’s transcription checkout and add your file(s) by uploading them from your computer or sharing a link to a website (ie: Youtube, Vimeo, Dropbox, etc). 2. Once you’ve uploaded your file, click on the ‘Rush My Order’ option below the Subtotal. Clicking on ‘Rush My Order’ will update your estimated delivery time and the overall cost. 3. Once you’re ready to move on, click on one of the Checkout buttons to complete the order process.